By Jude Igwemezie, Ph.D., P.Eng. 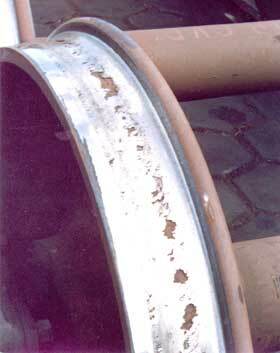 Over the years, rail grinding has become more the norm than the exception as the rail industry has recognized that damaged materials on the rail and wheel contact surfaces must be addressed before they become a bigger problem. The art of rail grinding has also progressed to point that it has become a preventive rail maintenance tool that can extend rail life. In recent times, top of rail (TOR) lubrication has also been used to reduce TOR friction on the low rail and overall lateral forces, which are known to cause problems such as fastener fatigue, plate cutting on timber ties, and rail seat abrasion on concrete ties. An understanding of the fundamentals of contact mechanics, wheel and rail geometry and friction at the wheel/rail interface can help rail managers prolong rail and wheel asset life. Contact mechanics can be explained through the use of two axially aligned and rolling cylinders of equal diameter in contact, as shown in Figure 1. A plot of the transverse stress contour in both cylinders can be made under different contact friction conditions. If initially, the friction between the cylinders is zero (saturated lubrication), the maximum stress is subsurface (see Figure 2). In the case of the wheel and rail, maximum subsurface stresses could reach 300 ksi. 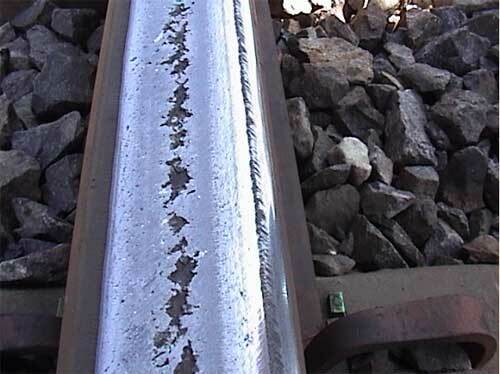 This means that maximum damage will begin inside the rail and lead to spalling of the top of the low rail, or to gauge corner shelling in the case of the high rail. It also means that with saturation lubrication, initiation and propagation of fatigue damage is driven “underground” and starts inside the metal where they are not visible. As a result, spalls as deep as 1/4 inch (as shown in Figure 3) on the low rail, and shells of similar depth (as shown in Figure 4) are formed, requiring grinding to remove the excess material. 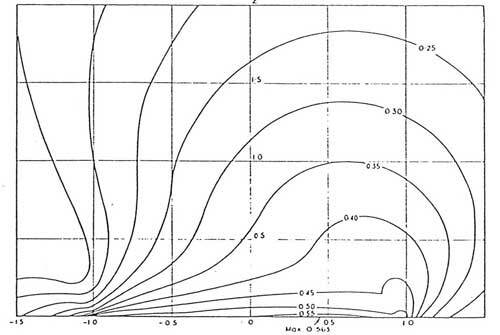 As friction increases, the maximum stress is drawn toward the surface, reaching it at approximately 0.5 friction coefficient (see Figure 5). This means that with significant friction, the damage starts where it is visible and progresses inwards. Also with friction, there is opportunity to wear away the material that is contact fatigue damaged. On the other hand, where there is friction, there is energy loss. The challenge for rail operators is to find a balance between rail wear, acceptable depth of subsurface crack initiation, and risk of detail fractures (DFs) and transverse defects (TDs) that are not visible until it is too late. The geometry of the wheel/rail contact and the friction between them becomes paramount. Examination of the contact between the wheel and rail in curving action, as shown in Figure 6, shows that the wheel tread makes contact at the top of the high rail while the wheel flange applies curving and steering lateral forces at the gauge face. There is no flange contact on the low rail, resulting in both vertical and lateral forces being applied at the top-of-rail running surface. 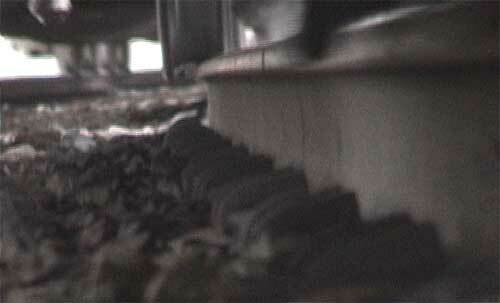 As a result, the moment arm of the overturning force on the low rail is higher than that on the high rail. The maximum lateral load that can be applied to the top of the low rail is the vertical load on the wheel multiplied by the coefficient of dynamic friction at the top of the low rail. This is why it is necessary to lubricate the top of the low rail in order to avoid low rail rollover derailments immediately after rail grinding. Lowering the friction through the use of TOR lubrication reduces the lateral forces experienced by the low rail. The flange force on the high rail, which is determined by the lateral force on the low rail, is also reduced. 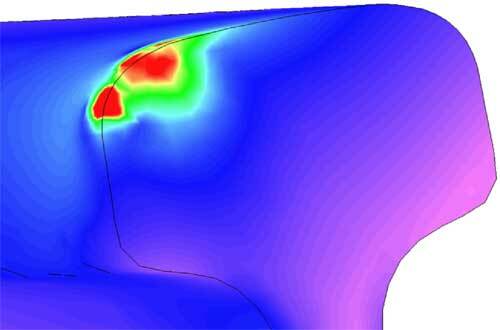 Lowering the friction at the wheel/rail interface drives the fatigue defect formation subsurface, however. In order to keep the contact fatigue stresses to a minimum, maintenance managers must ensure that the rail makes contact with the best mating surface on the wheel for the entire length of the train. This is where the track gauge and positive gauge retention come into play. Figure 7a shows the wheel contact with the low rail at the head end of a front-end-only powered train where the gap between the wheel flange and the gauge side of the head of the low rail is acceptable. Contrast this with the image in Figure 7b obtained from the tail end of the same train, where the wheel flange has drifted farther from the head of the low rail due to progressive gauge widening. In this case, the wheel flange is up to 2 inches away from the side of the railhead and is riding on the false flange, providing a smaller radius of contact with the railhead. 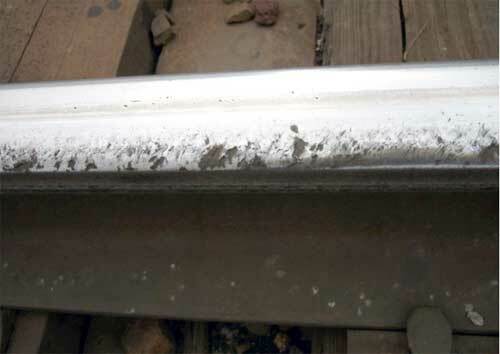 The resulting high intensity contact stresses caused spalling of the rail within less than one month after rail grinding, leading to the need for more grinding and rail wastage. 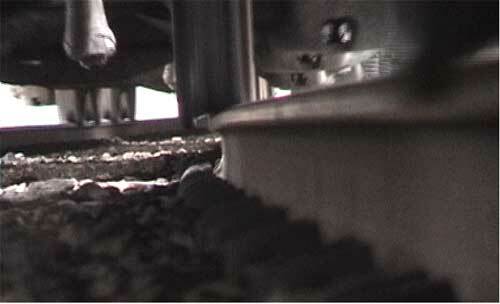 Installation of elastic fasteners provided the restraint necessary to prevent gauge widening under trains. On the high rail, if the angle of the grinding stone used at the gauge corner is shallow, a sharp ridge can be left behind. The lack of elastic fasteners will allow the rail to rotate and show the high point on the gauge face. The resulting contact stresses will be as shown in Figure 8. Both of these issues would combine to cause shelling at the gauge corner of the high rail. These shells quickly turn transverse, leading to a detail fracture (shown in Figure 9). 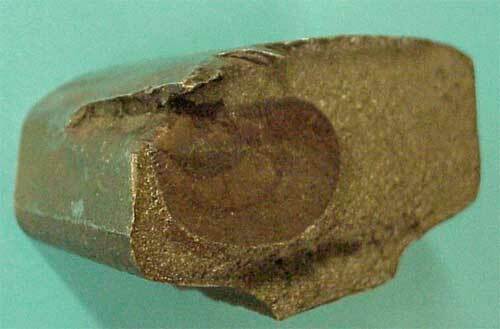 Note the depth of the shell before it became a transverse fatigue defect. To correct such a defect would necessitate removing more than 1/4 inch of material from the gauge face of the high rail. Such a severe corrective measure would significantly shorten the usable rail life. Hence, restraint of the rails against gauge widening is paramount for curve rail life extension. How does the radii of the wheel and rail and friction between them relate to the relief interval before the initiation of contact fatigue? Figure 10 shows the effect of low-rail crown radius and friction coefficient on maximum stresses in the rail head. The analyses were performed using a 33-kip wheel load and a new 1:20 wheel profile. As can be seen, maximum shear stresses increase with a reduction in rail crown radius and an increase in friction coefficient. Table 1 shows these stresses when converted into the period before fatigue initiation (based on the fatigue strength of the rail material). Reducing the friction coefficient to 0.2 provided a relief period of 12.4 mgt of life before the initiation of rolling contact fatigue. The relief period can be as low as 2 mgt with a friction coefficient of 0.4. While low friction is better, it can drive the damage underground and affect the adhesion capability of the locomotive. You do not want to stall trains, burn the rail or consume unnecessary fuel. A friction coefficient below 0.35, while good for reducing rail stresses, would affect the adhesion of the locomotives’ wheels and the ability of the locomotives to pull the train. Assuming a coefficient of friction of 0.35 at the top of rail (obtained through the use of TOR friction modifiers) and the average wheel loading we can determine the appropriate interval between rail grinding cycles. The key is to determine the appropriate intervals for a given line, based on wheel loads, gross tonnage, wheel and rail profiles, and lubrication conditions, before the initiation of fatigue damage. A grinding plan designed in this manner will optimize rail life.